These hard sticks of wax are designed solely for the use of woodturners and are made from a special blend of animal, vegetable and mineral waxes including Carnauba (the hardest of all waxes) for a hard bright shine and durability, Ozocerite and Ceresin (high melt waxes) for extra hardness, shine and water resistance, Microcrystalline for added water resistance and durability, and just a hint of beeswax. The Waxtik is applied directly to the work whilst it is spinning in the lathe, then with the lathe still running the wax is melted on to the work piece through friction. This is done by applying a clean soft rag to the work and moving it slowly across the face of the turned piece. Use heavy pressure for a satin finish and light pressure for a more lustrous sheen. Second and subsequent coats may be applied if needed. For a high shine apply a coat of shellac or spirit varnish to the turned piece then immediately apply the Waxtik as described above. 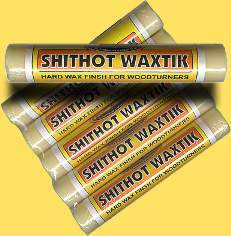 Shithot Waxtik is NON TOXIC and totally safe for use on all food implements, bowls, babies rattles etc. However being a wax it may show a dull or white spot if wet. This can be repaired by using our Traditional Wax. Huon Pine, Oak and Elm, all respond brilliantly to being waxed with Waxtik with no other finish being applied.